For the last 4 decades we’ve been playing videogames in much the same way – via a box plugged into a TV. Although consoles have increased dramatically in terms of power in that time, the overall setup hasn’t really changed all that much – until last week when Google announced their new gaming platform called Stadia at the 2019 Game Developers Conference. Stadia ditches the box along with physical copies of games and promises to stream games directly from Google’s servers to basically any device with a screen – be it your TV, PC, laptop phone or tablet. A remote server does all the graphical heavy lifting and beams the game footage directly to you. If Google can pull it off, it would mean no more expensive consoles or PCs and no waiting hours for a new game to download. In his presentation, Google’s Phil Harrison said that you could click a button and be playing a fully-fledged, AAA quality game in under 5 seconds. It sounds incredibly ambitious, but if there’s one company that has the technology, the resources and the infrastructure to do it, it’s Google. Modern consoles are designed to run even the most graphically intense games in at least 1080p HD resolution at a solid 60fps. Google says that Stadia can do the same. They used Assassin’s Creed Odyssey as an example, which met those performance benchmarks when streamed over a 25 megabits per second connection – which is admittedly faster than an average person’s standard home broadband setup, and doesn’t take into account other people using the WiFi at the same time. Stadia prioritises frame-rate over resolution, and Google say that games will drop in resolution if necessary (down to a minimum 720p) in order to maintain a steady frame-rate. Some critics are understandably worried about lag. It doesn’t hurt your enjoyment if a Netflix movie or a live football match is lagging a few seconds behind real time, but a fast-paced action game would become unplayable if there was even a fraction of a second delay between a button press and the on-screen action. Google promises that any delay will be imperceptible thanks to advanced compression technology and their large network of data centres. 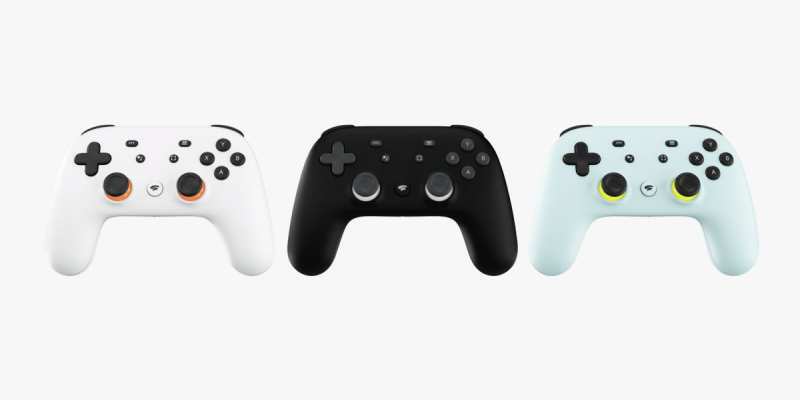 In addition to the Chromebook and the Pixel line of phones, Google had a new piece of hardware to show off – the Stadia controller. It features a familiar setup, with two analogue sticks, a D-pad, 4 face buttons and a 4 shoulder buttons – but it also has an extra button that allows you to instantly stream your gameplay online. Stadia will work with any standard USB controller and we did see a demonstrator playing Assassin’s Creed with a mouse & keyboard, before instantly & seamlessly switching over to a smartphone with a controller attached. The controller connects directly to your WiFi, bypassing your device. This makes your connection a little quicker and means you don’t have to re-sync your controller every time you switch devices. Gaming channels are amongst the most popular content on YouTube, and Google has visions of people watching a game and clicking a link to instantly try out the game themselves. Players can also save their ‘game state’ and share it using a link. So for example if you’re stuck on a particularly tricky puzzle, you can share a link with a friend and they can pick up exactly where you left off and complete the puzzle for you. Along with Ubisoft’s Assassin’s Creed Odyssey being used to demo the platform, Id Software’s Doom Eternal (the follow-up to 2016’s Doom) was also mentioned in the presentation as a confirmed title. Spanish studio Tequila Works and Japanese Q-Games are also confirmed developers, plus Google has announced its own in-house development studio called Stadia Games and Entertainment headed up by Jade Raymond, formerly of Ubisoft and EA. We’re expecting more launch titles and developers to be confirmed over the coming weeks and months. Stadia will be able to do things online that traditional consoles simply can’t. Online games can handle thousands of players at once rather than dozens, and online worlds will be more ‘persistent’ – for example, if a building is blown up, everybody sees it happen at once and it stays blown up forever. We didn’t get a exact launch date, but we were told Stadia will be available in the Unite States, Canada, the UK and “most of Europe” in 2019. Stadia has been described by some as the “Netflix of gaming”. We’re assuming that there will be some sort of monthly subscription cost, but so far we have no idea what that will be. Stadia is going to require a pretty beefy (i.e. expensive) internet connection to be viable, and that combined cost could be enough to put many people off. What happens to your saves? We don’t yet know if your game data (such as saves) will be stored on a local device or within an account in the cloud. We also don’t know if you can download games for offline play or if there’s any way to permanently ‘own’ a game. Google has revealed very little about how much data an average gaming session will consume. This will be a big concern for anyone playing on a 5G mobile device or anyone with data caps imposed by their broadband provider. When will it launch in other markets? Even in Google’s home country of the United States, there are many large rural areas that don’t have very stable internet coverage. Similarly, there are other countries and regions around the world that just don’t have the infrastructure to access a service like Stadia. We don’t yet know how Google plans to address this. When is the exact launch date? Google didn’t announce a solid launch date. All we know is that they’ll be back with another big presentation in June, and that Stadia will launch in selected markets in 2019. Watch this space for more Stadia news! If this is a Netflix-style service then I’d be willing to give it a shot. But if I have to pay full price for a game, but it will only let me access it through my streaming library, and I can never download it, then I’m out. There is no way am I spending money on games that I’ll lose as soon as Google gets bored and decides to shut this down. ← How has the UK’s driving test changed — and are there more changes to come?